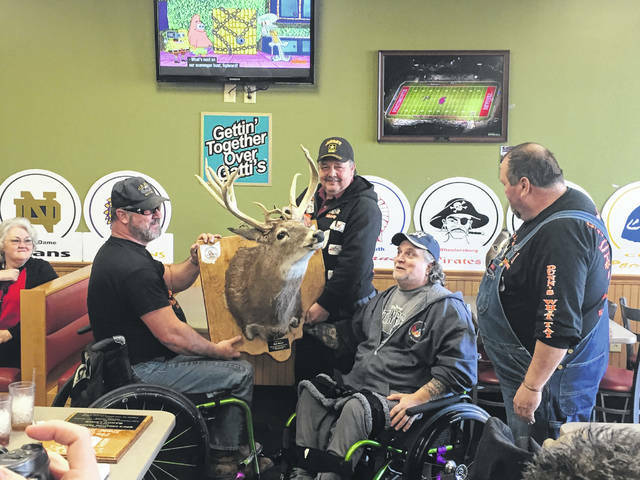 United States Navy Veteran Ron Wood, Second from right, receives his No Kill Deer Hunt trophy. Also pictured in the presentation are from left, United States Army Veterans Rick Bell and Mike Bell and No Kill Deer Hunt organizer Todd Dunn. Rick Bell, left, presents Isaiah DeLotell with his No Kill Deer Hunt trophy. Mike Bell presents Kayla Garland with her No Kill Deer Hunt trophy. Disability is not in the vocabulary when one comes to Dunn’s Farm for the No Kill Deer Hunt. Whether a person is confined to a wheelchair, totally blind, or even not having use of their arms, Dunn has made it possible for them to hunt a deer on his farm. The trophies were delivered Saturday from this season’s No Kill Deer Hunt. Disabled veterans and children gathered at Gatti’s Pizza in Portsmouth to receive their trophy they bagged last fall. Dunn, who is a Mason, said he was inspired by the Mason teaching to give back. He said he credits fellow Mason Claude Duckworth with helping get the No Kill Deer Hunt started, but many others have been involved to make it the success it has become. 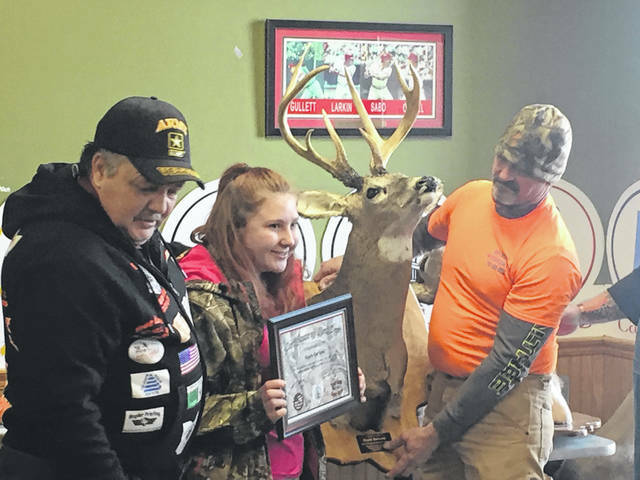 From taxidermists to those donating bucks to the farm, Dunn named all involved Saturday, including God’s Creation Taxidermist, Jed’s Taxidermy, Buckeye Taxidermy, Crooked Horn Taxidermy, Gatti’s Pizza, All Seasons Heating and Air, and Dan and Pam Paden, who donated a 26 point buck to the farm. For this year, Dunn is optimistic saying he wants to increase the amount of hunts. He also said his cabin for veterans to come spend a weekend is still under construction. He said he hopes to have it ready this year. April 27th disabled veterans and children with disabilities will be able to participate in the Annual Turkey Creek Trout Derby. A section of the lake will be reserved on April 27th for the group to fish and have fun. According to Mike Bell, President of the Autism Project of Southern Ohio, who is helping with the derby, disabled veterans will help the children with disabilities during the derby. Excitement was in the air from those in attendance when the trout derby was announced Saturday. Those who received their trophies Saturday to put on the wall at home were: Isaiah DeLottell, Donny Abrams, Luke Mayberry, Kayla Garland, Kelly Furnish, and Ron Wood. Wood, a United States navy veteran was paralyzed from a car accident. He said the No Kill Deer Hunt gives him an opportunity to do something he never thought he would ever do again.